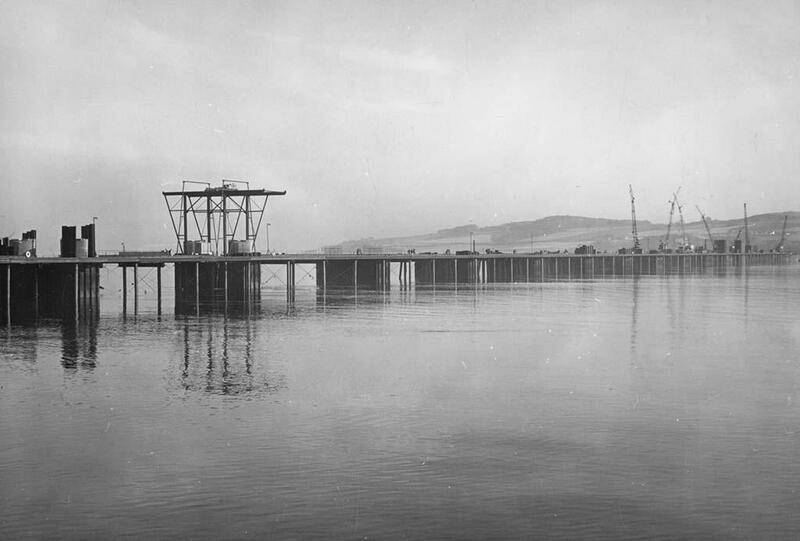 The Tay Road Bridge could be finished by March 31, 1966, three months ahead of the original target date – or even earlier. But to achieve this may mean relieving the Caledon Shipbuilding and Engineering Co., Ltd., Dundee, of part of their sub-contract for steel girders, on which work they are falling behind. This was reported to the Tay Road Bridge Joint Board on Thursday. Mr W.A. Fairhurst, the consulting engineer, recommended that the board should meet the cost – about £30,000 – of having part of the Caledon contract done by another firm in the interests of having the bridge finished more speedily. The saving to the board, he estimated, would be about £45,000 if the bridge were finished three months ahead of time. 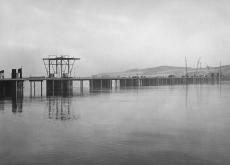 Mr Fairhurst said it had become clear that the rate of delivery and erection of the girders could not be accomplished by the steel works contractor to accord with the specified bridge programme, let alone the accelerated programme not envisaged by the main contractor, Duncan Logan (Contractors) Ltd. He said Sir William Arrol & Co., Ltd., Glasgow, who were second lowest offerers, were at present in a position to undertake the work and deliver the girders in time to suit the accelerated programme. This would entail additional expenditure of £23,000. A further sum would probably require to be expended by the contractors in respect of transport alterations. Mr Fairhurst said the Caledon Company would welcome relief from this part of their contract, as it should be possible thereafter for them to keep up with the revised programme proposed by Logan’s. By six votes to two the board approved the motion by Mr John McWilliam, Fife County Convener, that no action be taken and the contents of the report noted. The death knell sounded this week for the Royal Arch, the 80 ft. high landmark at the harbour. It is to be demolished in the middle of next month and the stone used for dock filling. The Tay Road Bridge builders, Duncan Logan (Contractors), Ltd., said this week they will demolish the landmark from the top downwards. The Royal Arch was built over a century ago to mark Queen Victoria’s 1844 landing at the harbour. Monday, January 6 – and all week. January 25 – a date that stirs the heart of all true Scots the world o’er. A date when humble honour is paid to the memory of Robert Burns. Dundonians met in the Art Galleries for a Burns concert on Wednesday night and proved that the magic of his poetry and music is still very much alive. With over 350 in the hall, several others had to be turned away for lack of space. The Stobswell Ladies’ F.P. Choir under its conductor, Miss Anne S.W. Robertson, sang such well-loved favourites as “Afton Water”, “There Was a Lad” and “Scots Wha Hae”. Guest artistes were Norma Tasker (soprano), David Imrie (baritone), and Ronald Ganella (violin). Accompanists were Susanne Watson (choir) and Isobel Darroch (soloist). Two years ago Mr Joe Devlin, 5 Glenesk Avenue, retired from work. And with plenty of time on their hands Joe and his wife Anne decided to take up ballroom dancing. When they presented themselves at the West End School of Dancing last April the lively old couple had thoughts of only fun and enjoyment. Bob Barty was impressed by their flair for dancing and their ready response to his coaching. With some difficulty he managed to persuade them to have a go at the bronze medal test. Entering “just for a whirl” Joe and Anne were astounded to learn they had passed. Their awards were presented last week by Dundee F.C. star, Alex Hamilton. Above All for Cuisine and Service. 1. I Want To Hold Your Hand – The Beatles. 2. Glad All Over – Dave Clark Five. 3. Hippy Hippy Shake – Swingin’ Blue Jeans. 4. I Only Want To Be With You – Dusty Springfield. 5. She Loves You – The Beatles. 6. Twenty-four Hours from Tulsa – Gene Pitney. 7. Kiss Me Quick – Elvis Presley. 8. Secret Love – Kathy Kirby. 9. Dominique – The Singing Nun. 10. You’ll Never Walk Alone – Gerry and the Pacemakers. Wednesday is a big night for local “popsters”, with the Palace being taken over for a night of “big beat”. For “popsters”, three groups will be on parade, Mark Dayton the Honours (recently voted Scotland’s No. 2 beat band), the Black Diamonds, and Mark Sayne and the Hellions. The supporting programme includes Kay Love and Frank McCafferty and Jimmy Mather. Next Saturday, Johnny Victory will be back in town and among his guests will be a unique strong man, who has been in great demand all over the country. Gift Boxes – Keep Christmas cards which have glittery flowers or trees. When you need a little gift box, paint a matchbox over with gold paint. Cut out the decoration and glue to the box. Miss C. McCullock, Ballinluig, Perthshire. For Motorists – A plastic baking spatula is the ideal tool for removing frost and frozen snow for car windows. Mary Morrison, Edinburgh.